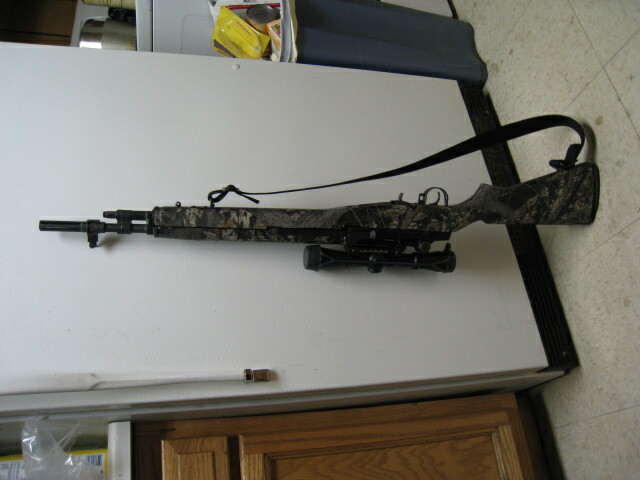 I have been doing a little customizing of my M1A Bush Rifle. Thought I would share a few pics as this could be applied to modifying other synthetic stocks. My biggest dislike of the M1A is the exposed operating rod, it just seems like the fingers of my support hand always end up on the rod and upon firing, my grip is compromised. I decided to fix this problem. I found an old power hacksaw blade and ground out a section the correct shape to epoxy to the forearm to cover the op rod. I then sanded the stock at that area and using Brownells Acra-Glass Gel epoxied the blade to the forearm. There is clearance between the back of the blade and the op rod. After the epoxy set, I covered the exposed steel of blade with more epoxy and contoured to blend with shape of stock. Another minor gripe I have of the synthetic M1A stock is the minimal pistol grip. Especially when shooting from prone, it just does not give much to hold on to. I decided to address this issue as well. 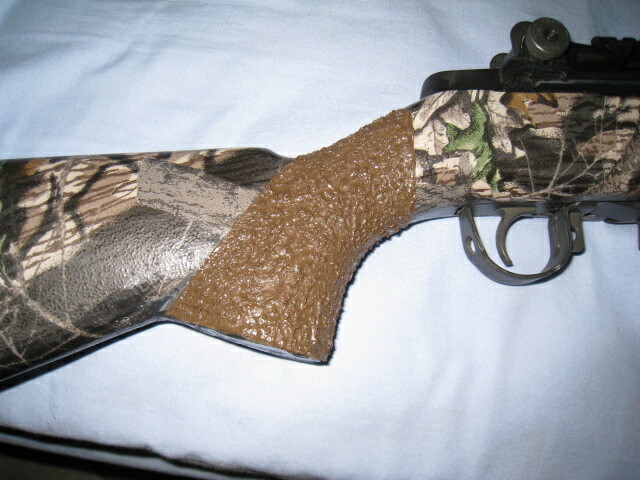 I built up the pistol grip with the same epoxy, making it longer, wider, and more vertical. After this set up, I put a thin layer of epoxy on both grip and forearm and after waiting an hour, letting the epoxy set up a little, I textured the epoxy using my fingers in a zip-lock bag. The result is a rough textured gripping surface much more effective than any checkering. I will paint the stock soon using Brownells Aluma-Hyde but took a few pictures as it is now. So far I am very happy with the results. Before. Notice exposed operating rod and shallow grip angle. Thanks for the pics, looks like some good work. I'm interested in seeing pics after you've finished repainting it. Here is a finished picture. Painted using earth brown and matte black Aluma-Hyde. 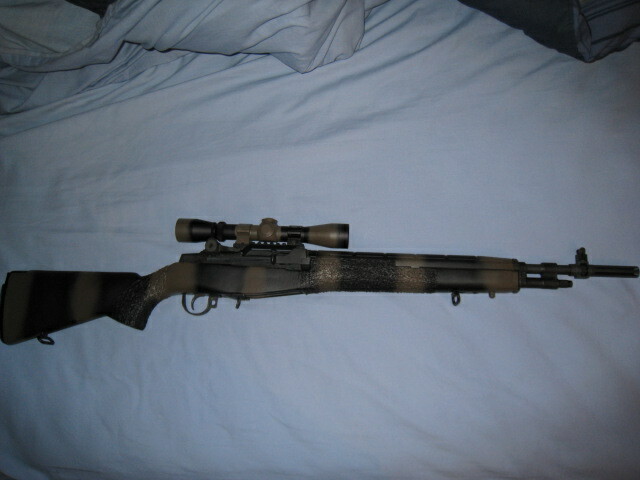 I also painted the Leupold 2-7 to match. I did a simple, wide stripe pattern and am very happy with how it turned out. 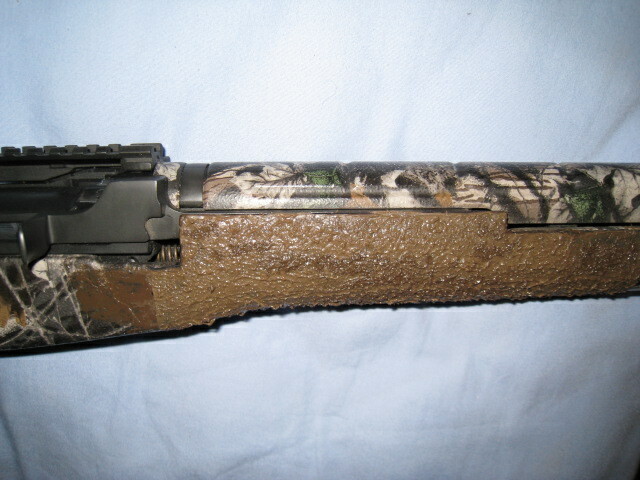 I am not a big fan of overly detailed camo patterns, especially on firearms. Looks good! Thanks for the update. Dimpling the stock is a good trick to improve grip on a dry or wet stock. Finished job looks great! I can't do that on mine because it is a McMillian stock, but then my Super Match is not intended for the 'fight' anyhow.